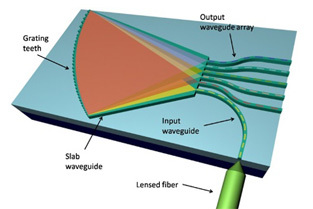 The incident light is coupled into the input waveguide by the lens fiber, and then diverges into the slab waveguide region. After reflected by the echelle grating teeth facets, the different wavelength components of the incident light converge to the different output waveguides. Lab-on-a-chip is a hot topic in current scientific community. The objective of lab-on-a-chip is to accomplish the preparation, reaction, detection, and analysis of samples in a traditional laboratory on a chip, thus making the above mentioned series of operations chip-based, integrated, automated, low-cost and high efficient. As a key functional element for sample detection and analysis, spectrometer-on-a-chip will strengthen the ability of lab-on-a-chip to a considerable extent. In response to this demand, the researchers have fabricated a high-resolution spectrometer-on-a-chip on silicon-oxynitride (SiON) waveguides based on echelle diffraction grating, working around 850 nm. They chose 3-stigmatic point method to design the basic structure of the grating to satisfy the device requirement for dispersion, resolution and phase error. The 3-stigmatic point method means that there are three zero-phase-error points along the output facet, which reduces the overall phase error compared to the traditional 1- or 2-stigmatic point methods. Besides, the researchers set up a scalar diffraction model to simulate the light propagation in the grating. Based on the simulation results, they optimized the grating structure and thus improve the spectral analysis performance. For the experimental fabrication, two challenges exist. The first one is to solve the problem about SiON core waveguide film deposition by plasma enhanced chemical vapor deposition (PECVD), concerning the issue of control of refractive index, thickness and uniformity. The second one is to optimize the deep etching process for SiON core layer and SiO2 cladding layer so as to obtain vertical and smooth sidewall, hence reducing the device insertion loss and crosstalk, and enhancing the resolution as well. "As the signal processing is mainly achieved by electron, to make our on-chip spectrometer more robust," Prof. Jianjun He adds, "We will try to integrate photodetector onto our chip and convert the optical signal into electrical signals getting closer to fully functional lab-on-a-chip."